Enter your email address to subscribe to the artist blog and receive notifications of new posts by email. 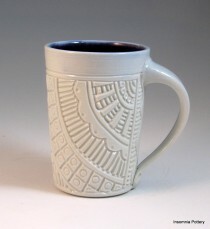 A porcelain coffee cup from my March 3, 2013 firing. Beautiful purple-blue glaze inside, with pretty little flecks from the tin. 4.5″ Tall, $40, Sold, others available.